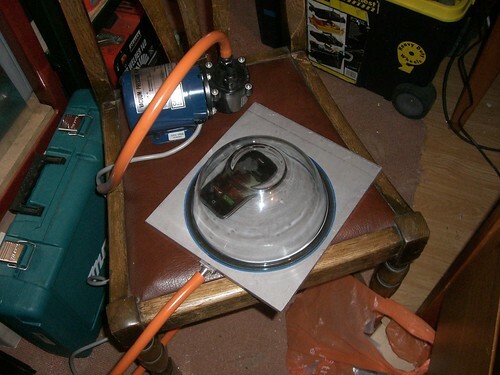 I needed a vacuum chamber to remove the bubbles from liquid casting investment.I made it from a 10mm plate of aluminium and a thick glass mixing bowl. 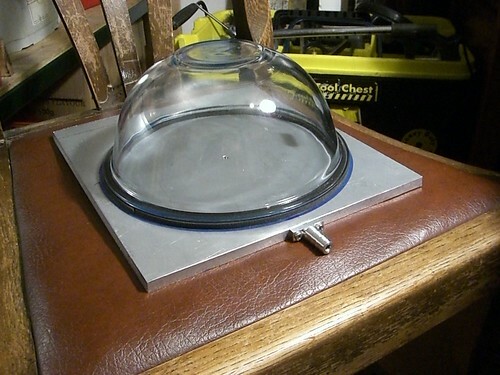 Since the base would double up for vacuum casting (in which a casting flask sits on a heatproof silicone gasket and the glass dome isn't used) I needed the vent hole to be in the middle of the slab. 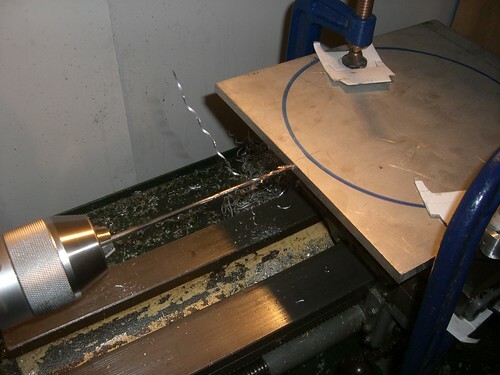 I started by making a really long drill bit. I took an old 4mm drill bit, and ground the shank down to half thickness. 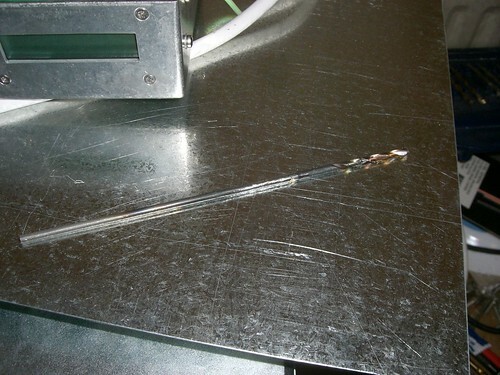 I ground a corresponding flat on a length of steel rod, bound the two components together with fine steel wire, and laid the assembly in a piece of angle to hold them parallel. I brazed them together with a MAPP torch. 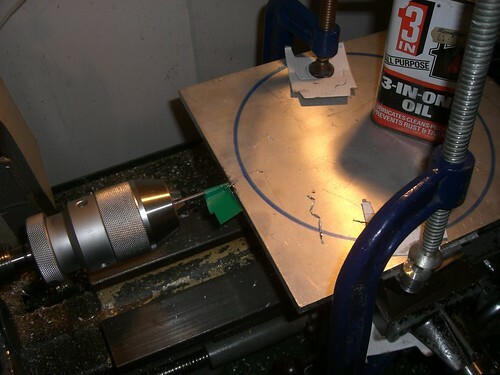 Here's the finished drill bit. It ended up beautifully straight, probably through more luck than judgement. 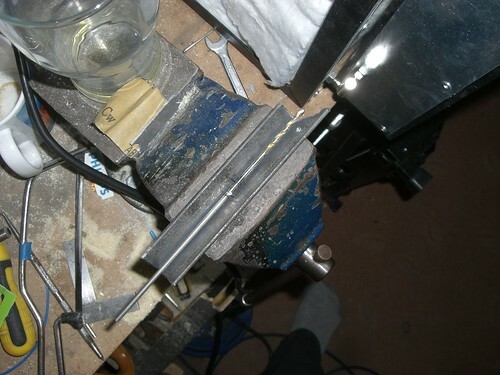 I drilled the plate sideways on the lathe, then drilled down from the top to meet the hole. 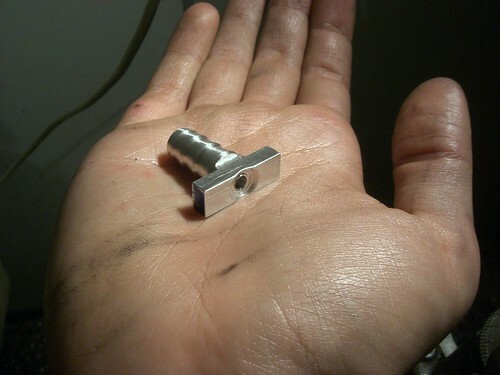 I machined this nozzle component to be a friction fit on a length of hose. It has a recess for an O-ring. 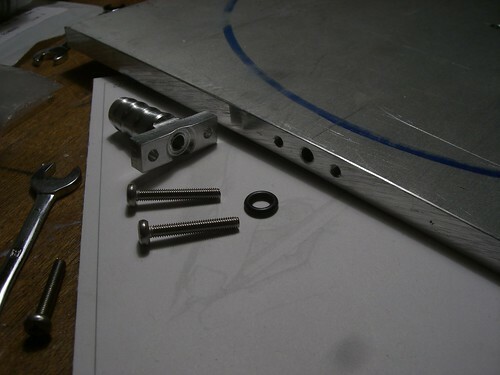 I drilled and tapped mounting holes either side of the vent hole. 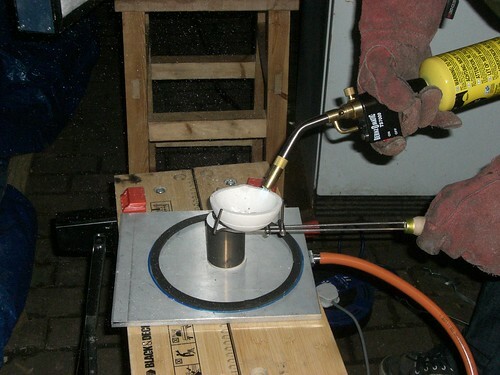 I made a sealing gasket from adhesive-backed neoprene foam tape (Farnell 536805) . Can recommend that material for seals; did the job perfectly. Here's the whole setup with a ringing phone inside. When pumped down, it was inaudible.As a finishing touch I added some sticky rubber feet. 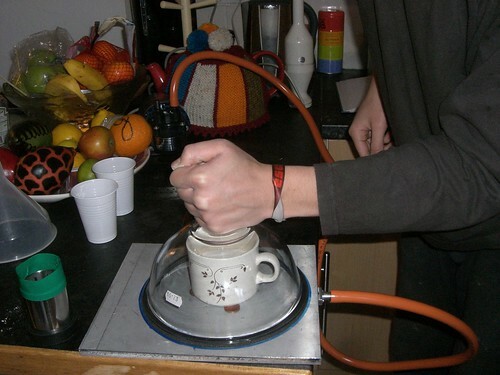 Here it is being used in a vacuum casting attempt. My pump is too weedy and I never got a complete fill with this technique, so I eventually abandoned it for centrifugal casting. Submitted by Anonymous on Tue, 09/25/2018 - 00:38. Submitted by Anonymous on Fri, 11/02/2018 - 22:01. Submitted by Anonymous on Tue, 10/30/2012 - 10:12. Submitted by Anonymous on Fri, 09/11/2015 - 09:50. Submitted by Anonymous on Fri, 03/18/2016 - 14:18. Submitted by Anonymous on Thu, 07/05/2018 - 20:50. Submitted by Anonymous on Wed, 09/05/2018 - 23:02. Submitted by Anonymous on Sat, 08/18/2018 - 19:47. Submitted by Anonymous on Thu, 09/20/2018 - 12:24. Submitted by Anonymous on Fri, 11/13/2015 - 19:47. Submitted by Anonymous on Fri, 02/26/2016 - 15:11. Submitted by Anonymous on Sun, 05/15/2016 - 07:24. Submitted by Anonymous on Wed, 07/04/2018 - 15:45. Inspiring story there. What happened after? Thanks! My homepage chiaki.vn bán hàng gi? Submitted by Anonymous on Sat, 07/21/2018 - 05:19. Submitted by Anonymous on Thu, 08/30/2018 - 16:16. Submitted by Anonymous on Mon, 05/28/2018 - 23:40. Submitted by Anonymous on Mon, 09/17/2018 - 07:34.
phân ?h?i chung ?? vincity Havee ? look at myy w?b blog; chung c? vincity ? ?i m? Submitted by Anonymous on Thu, 04/06/2017 - 01:35. Submitted by Anonymous on Mon, 09/18/2017 - 10:06. Submitted by Anonymous on Tue, 04/10/2018 - 12:34. Submitted by Anonymous on Thu, 04/19/2018 - 02:28. Submitted by Anonymous on Mon, 08/13/2018 - 11:58. Submitted by Anonymous on Wed, 06/20/2018 - 17:11. This can include their promises to players about how precisely they'll treat them as detailed information concerning the outcomes of past reviews and audits. Third lastly, congratulations, you enter another game using the new volume of $24. Face cards and tens are thought zero and with all the exception of ace that's worth one. Also visit my web blog :: ????? Submitted by Anonymous on Sun, 07/22/2018 - 20:02. Submitted by Anonymous on Wed, 05/09/2018 - 03:17. Submitted by Anonymous on Sun, 06/24/2018 - 03:24. Submitted by Anonymous on Mon, 08/27/2018 - 07:42. That is undoubtedly a private greatest for me. Also visit my blog :: ??? Submitted by Anonymous on Thu, 06/28/2018 - 12:54. Submitted by Anonymous on Mon, 07/02/2018 - 08:55. Submitted by Anonymous on Mon, 08/13/2018 - 18:51. Submitted by Anonymous on Sat, 01/30/2016 - 10:07. Submitted by Anonymous on Thu, 12/29/2016 - 18:35. Submitted by Anonymous on Fri, 09/08/2017 - 16:23. Submitted by Anonymous on Sun, 05/20/2018 - 09:06. There isn't any only solution-but lots of options like I stated in the start, there's no hard and quick manual which claims to the purpose answers into all of your problems. Today in the event you introduce a certain problem into a panel of experts, you can check here are sure to find many different opinions and options at yield. This can prove to become vexing. Submitted by Anonymous on Wed, 08/08/2018 - 17:20. Submitted by Anonymous on Wed, 08/08/2018 - 17:58. Useful gizmo for keeping the reader's attention. Feel free to surf to my page - ?????? Submitted by Anonymous on Fri, 06/29/2018 - 05:24. Submitted by Anonymous on Sat, 09/29/2018 - 15:50. Submitted by Anonymous on Fri, 07/17/2015 - 17:49. Submitted by Anonymous on Tue, 02/09/2016 - 01:54. Submitted by Anonymous on Thu, 06/02/2016 - 14:35. Submitted by Anonymous on Fri, 04/20/2018 - 18:10. Submitted by Anonymous on Sat, 08/13/2016 - 00:08. Submitted by Anonymous on Fri, 01/13/2017 - 12:57. Submitted by Anonymous on Wed, 03/07/2018 - 00:05. Submitted by Anonymous on Sat, 04/28/2018 - 19:54. Whenever we speak about building user experience for 'no shape' extrémité, UX designers will play an important role. They need to incorporate their understanding of natural human capacities such as communication, electric motor, cognitive, and perceptual skills with machine learning to make interfaces that connect with the person. In the recent times, interacting with machines has become instinctive. Moreover, the recent advancements in NUIs are guaranteeing that machines can understand human gestures, touch, tone of voice, and thoughts in a much better way. Even so, designing for Natural End user Interfaces is quite challenging as designers have to keep below parameters in mind. SOUNDS SCI-FI YET TIRING Minority Report like office sounds really cool, but working with hands upward for a for a longer time period tire people. URINARY INCONTINENCE should naturally and pleasantly interact with the users without tiring them. natural user cadre Image Credit rating CAN'T AFFORD TO SKIP THE ACCESSIBILITY Some signals might not be possible for users with afflictions. Therefore you can't do away with the support for assistive technology like Joysticks or electronic directing devices. MY FAT HANDS Fingers and thumbs are your direct link to touchscreen devices. Therefore, barrières should be designed keeping the size of touch targets large enough to respond to fat hands with adequate room given to not accidently faucet the near by links. Feel free to visit my homepage: ????? ????? Submitted by Anonymous on Tue, 04/03/2018 - 17:42. Submitted by Anonymous on Wed, 06/13/2018 - 17:35. Submitted by Anonymous on Fri, 05/04/2018 - 07:20. Submitted by Anonymous on Sun, 01/08/2017 - 18:18.